Our veterinarians perform a surgical onychectomy if they believe that a cat cannot be trained to refrain from using its claws destructively in the home, or poses a danger to family members. Unfortunately, not all cats are amenable to behavior modification and we believe that this surgical procedure will result in fewer cats being abandoned or euthanized. Once declawed, it is recommended that your cat live indoors since the ability to defend itself is compromised. Timing is everything when deciding on the optimal age to declaw your cat. Often younger, non-overweight cats are able to recover from surgery with fewer complications. However, your veterinarian can provide a one-on-one evaluation of your pet’s readiness and age for the procedure. 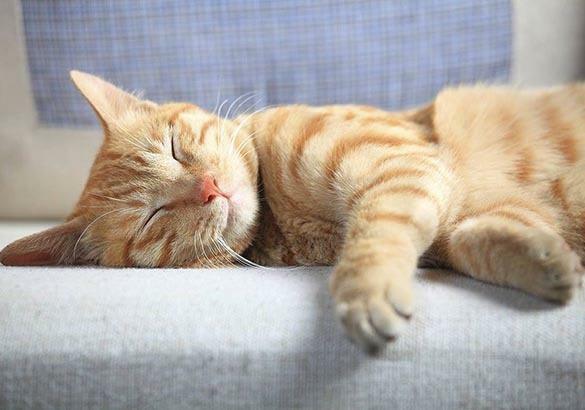 We also believe feline onychectomy should be performed only with the medically appropriate use of anesthetics and analgesics and adherence to careful surgical and post-surgical protocols. If you are shopping around for a competitive price on this procedure, be sure to question the type of anesthetic used, the type of pain management provided, and the monitoring equipment and procedures followed. All of our patients are fully examined prior to anesthesia and pre-anesthetic blood work is required for all animals before surgery. We use several anesthesia monitoring devices during your pet’s procedure. A veterinary technician continually assesses your pet’s vital signs during the surgery. Your pet’s safety and comfort are our primary concerns when performing a declaw. We use advanced pain management techniques in conjunction with anesthesia to make sure your pet is as comfortable as possible during the procedure and after they are discharged. Our declaw patients receive 2 or 3 injectable pain medications during the procedure and go home with oral pain medication. We only perform declaws using the surgical laser. When using the veterinary surgical laser, only an intense beam of laser light touches the tissue, which leads to less pain, less bleeding, less swelling, and faster recovery. Our declaw patients stay with us for two nights so that we can be sure they are comfortable and to assess the surgical area before going home. There are no bandages needed when using the surgical laser for declaw procedures. It is very common to see these kitties pawing playfully through the kennel door following this surgery.